A memorial service has been held to mark the 10th anniversary of a fatal plane crash in woodland in Coventry. A freight aircraft approaching Coventry Airport in poor visibility crashed in Willenhall Wood in December 1994, killing all five crew on board. A plaque was also unveiled close to the crash scene, near Middle Ride. People who witnessed the crash, members of the emergency services and residents all attended the service to remember those who lost their lives. Anita Sidoris, whose brother died in the crash, said: "I'm so grateful to the community for inviting us here. "It means such a lot to the family. We lost our only brother and (the plaque) is just a very fine thing." People living near the woods believe the pilot of the plane crashed in woodland to avoid coming down in a residential area and risking the lives of others. 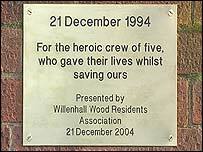 The plaque was paid for by the Willenhall Wood Residents' Association. Its chairman, Stuart Lanigan, said: "We think that it's important that (the crash) be recognised. "There's nothing grandiose about the plaque. "It's just an ordinary brass plaque with information on it, made by a local craftsman."